At least two people belonging to Hazara community have been killed and another two persons who were passersby injured in firing by armed men on Shahrah-e-Iqbal road in the main city, here in Quetta on Monday. Police said that unidentified armed men who were riding a motorcycle opened indiscriminate fire at a taxi car, leaving two man sitting inside the vehicle dead and injuring another two people. “A taxi car was on its way on Shahrah-e-Iqbal road when unknown armed attackers riding a bike opened fire at the vehicle that left two of the occupants of the taxi car dead on the spot and another two persons seriously injured,” police said. The rescue teams rushed to the site and shifted the dead and injured to hospital. 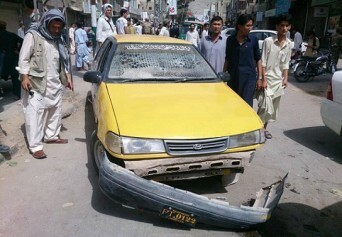 The police said that the dead belonged to Hazara community while the injured were passersby. The law enforcement personnel have cordoned off the area. Police have registered a case against the accused and further investigation is underway.